This is a set of 8 blocks on print backgrounds. 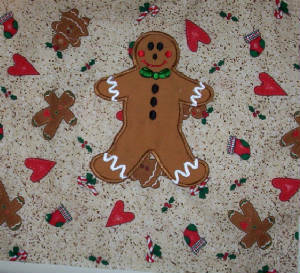 Price is $32.99.The gingerbread prints will vary. This is just a sample of the prints i use. You may or may not get this exact print, but all prints are good quality fabric.TO PURCHASE THESE SCROLL DOWN TO THE BOTTOM OF THE PAGE AND CLICK ON THE PAY PAL BUTTON. click here to buy gingerbread blocks on printed background. This design was digitized several years ago. 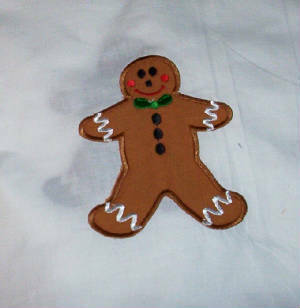 There are many new gingerbread designs out there now. 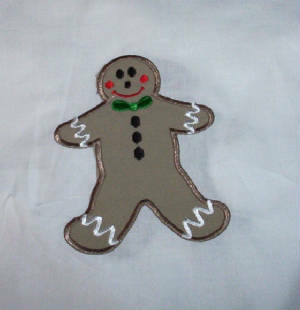 The samples below show the design on gingerbread prints , and good quality muslin. It looks good on most any fabric. A great design for christmas presents. Click here for gingerbread blocks on plain background.